As a journal-ist who is also a journal-er, I must say I love having a time of year that not only permits but encourages the acquisition of new calendars, date books, journals, planners and other goodies for helping keep track of the days ahead. The one I am most looking forward to using? 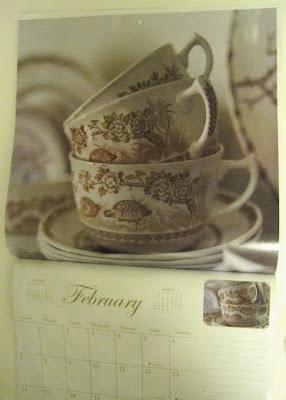 This page-a-day tea calendar I won in Bernideen's fall giveaway! I had seen this design in a store last year but assumed it was only a desk calendar, and since I don't really have much "display space" on my desk at work I didn't get one. Upon winning this giveaway I was delighted to discover the calendar also has a super duper magnet on back, so now it's on my kitchen refrigerator where I can enjoy using it every day of 2010! 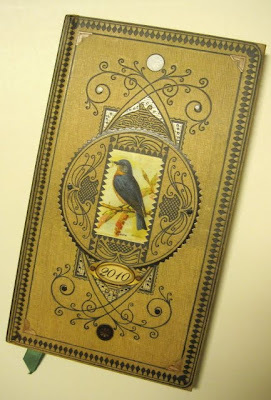 I received a lovely purse-size 2010 date book as a gift in the fall, so I didn't need to get one of those, but I did make sure to order the vintage ledger style Andrews and McMeel "Birds of a Feather" calendar. It's the third year I've gotten one, and I absolutely love this tall, thin ledger book. In it I write a single paragraph about what I did each day. When a friend saw my calendar and wanted one like it, I was surprised to learn these calendars have apparently sold out and the few copies remaining are commanding rather extraordinary prices on Amazon and eBay, so if you've got one, treasure it! 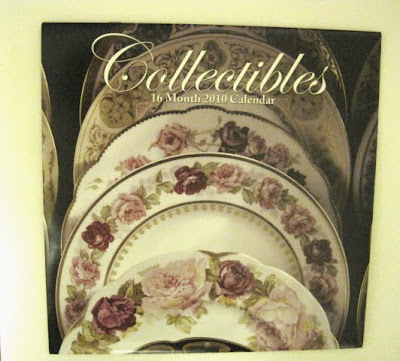 For the full-size wall calendar at home this year, I picked up one of the $1 cheapie calendars at Michaels, and I must say I am quite happy with this "Collectibles" calendar. 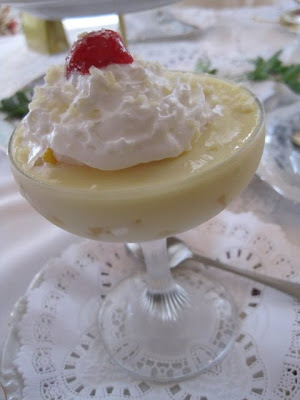 The photos include vintage dishes and teawares, old clocks and glassware and other lovelies. 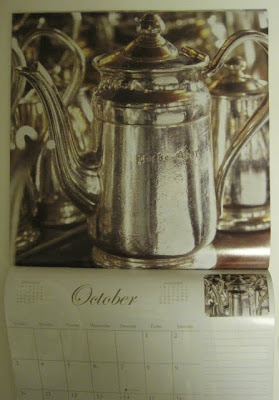 Oddly, I have not seen the classic teapot calendar anywhere this year, and that's the one I usually get to hang by my bulletin board at work. I'm still hoping to miraculously find one on the bookstore clearance racks in the days ahead. 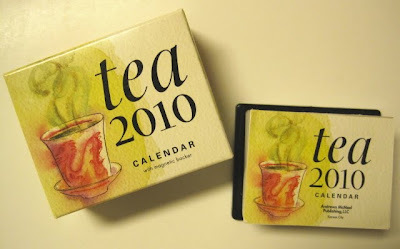 Do any of you have a new tea calendar for 2010? If so, would you mind sharing where you found it? Back during the summer, I got a pretty new water bottle and my sister apparently remembered me saying that yes, it was lovely, but it wasn't suitable for hot liquids, so I had nothing nice in which to take already-steeped hot tea to the office. 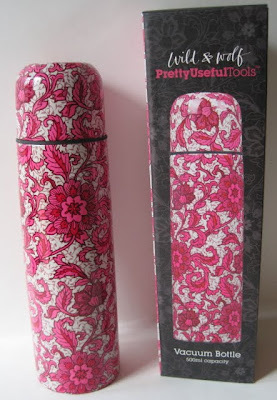 I was, therefore, delighted when I opened gifts from my sister's family at Christmas and found this beautiful Wild & Wolf vacuum bottle from Pretty Useful Tools, a company I'd heard about because of their great product designs. And while this bottle transports hot tea just great (I poured some in both the morning and afternoon at work yesterday, and it was still piping hot in the afternoon), what I think is particularly nice about this bottle is that there is an open/close button on top, and when you press down on the center, you can pour the tea without ever unscrewing the top! 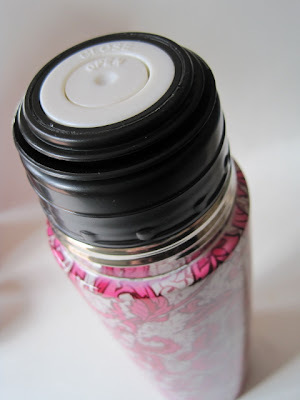 So if, like me, you've ever dribbled hot water or tea from a thermos across your desktop, this is a spillproof (and stylish!) way of solving that problem. 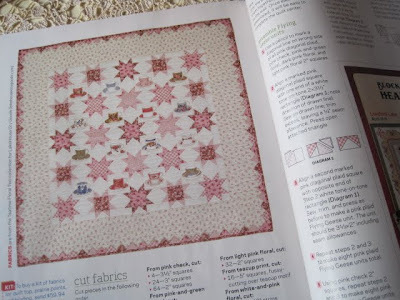 Several weeks before Christmas, I picked up the new (February 2010) issue of American Patchwork & Quilting magazine solely because it included a pattern for a beautiful -- and beautifully named -- Sweet Tea Quilt. 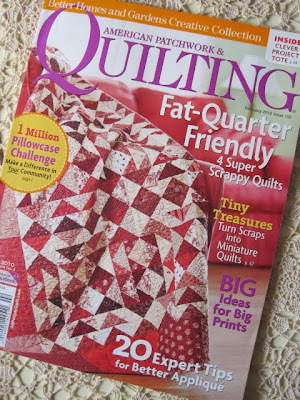 When my husband asked me what I wanted for Christmas, I happily sent him a link to this quilt kit at fatquartershop.com. 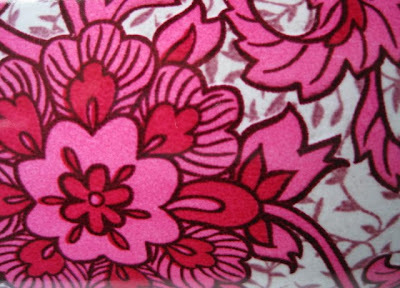 Can you guess what my first needlework project of the new year is going to be? 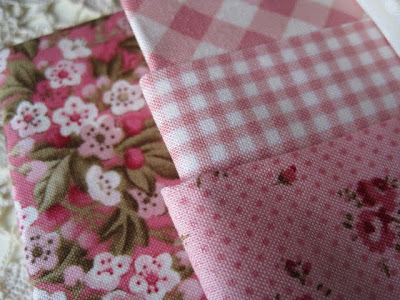 I've never really desired a quilt kit before, preferring to choose my own fabrics or take a "scrap bag" approach to making blocks and motifs, but this one I loved. 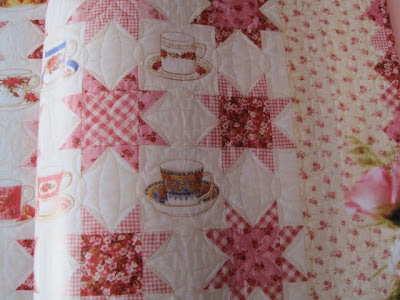 The pattern centers around blocks of individual teacups, and I think the pink fabrics they selected are just lovely! 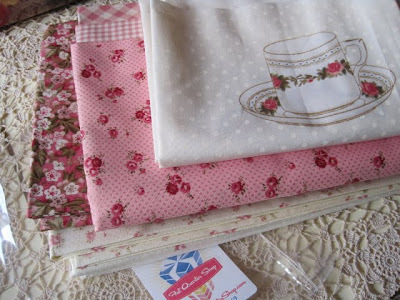 The fabrics are by Holly Holderman for Lakehouse Dry Goods and are part of the Teatime Floral Two collection. I plan to start this on New Year's Day, and you can bet I'll be posting about it along the way! 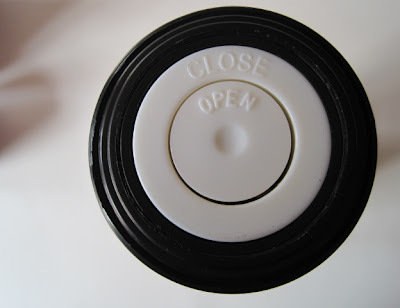 Blogs, like desks and closets, need tidying up from time to time, so I am using this wonderful period of "down time" at the close of the year to make a few changes I wanted to tell you about! 1. Beginning Jan. 1, 2010, I am dropping the "ncmag" from my blog's URL and will be simply teawithfriends.blogspot.com. When I began blogging nearly three years ago, I assumed only local residents would ever find me. Happily, that has not been the case, and I've learned non-local readers have sometimes had to search for me out in cyberspace because the "ncmag" pre-fix was hard to remember. This should remedy that. All the old posts have been imported to the new site. 3. There's also a new header up at the new site, so I didn't want anyone to think they'd gone to the wrong house! Same house but with a new coat of paint, and I hope you like it! This week between Christmas and New Year's is one of my favorite times of the year, mainly because it's a quiet, no-pressure time at work and home when I have nothing I simply *must* get done. 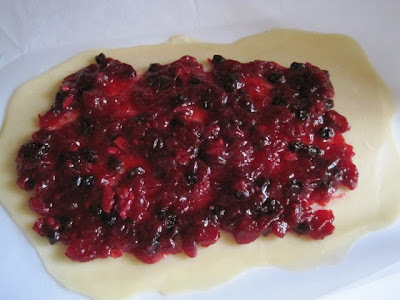 For that reason, I had time over the weekend to ponder whether it would be possible to use leftover cranberry sauce in a cookie and I discovered that indeed you can. 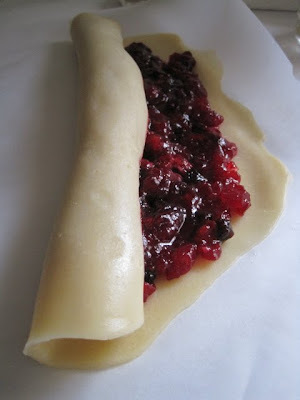 I'm sharing this today in hopes someone will want to make these cookies before throwing out that unused cranberry sauce! 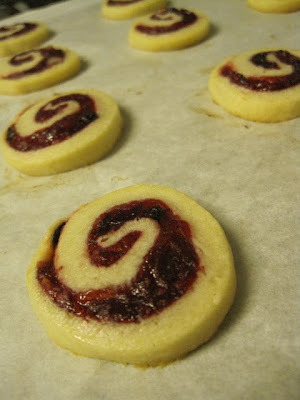 Aiming for some "pinwheel" type cookies, I decided to spread the sugar cookie dough (rolled to about 1/8 inch thickness) with the cranberry sauce -- this one containing some extra oomph from lemon zest, currants and pecans -- but I'll bet you could use whole-berry sauce in the can with similar results. 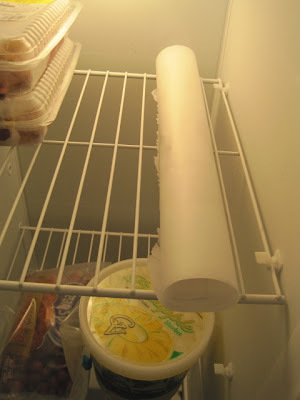 After I spread sauce on the dough and rolled it along the longest side, I popped the log of dough into the freezer for 2 hours to firm up for easy slicing. 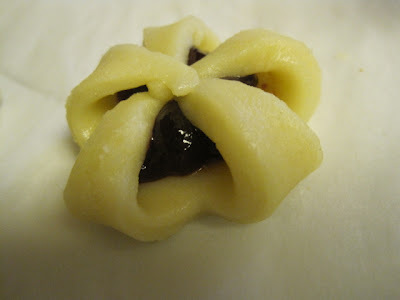 I'm a great fan of parchment paper in cooking, so here I was able to roll out the dough between a folded sheet of parchment paper, then freeze and bake on that same, single piece of paper. 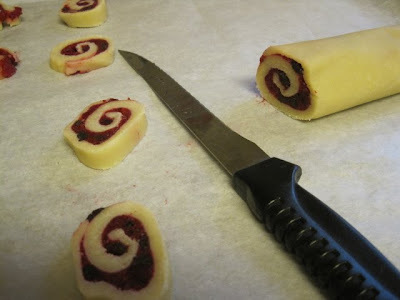 I sliced the cookies about 1/3 inch thick and got 20 out of the roll. Baked at 375 degrees for about 15 minutes, the cookies came out nice and bubbly and held their shape beautifully. The tart flavor was great with some of the new Christmas teas I've been enjoying. And here's that easy sauce recipe! 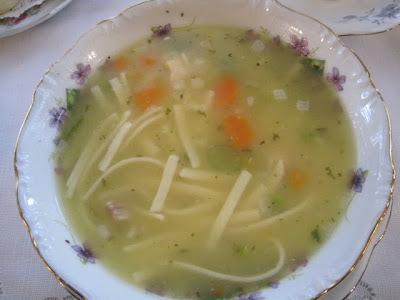 In a small saucepan, bring water and sugar to boil and stir until sugar is completely dissolved. 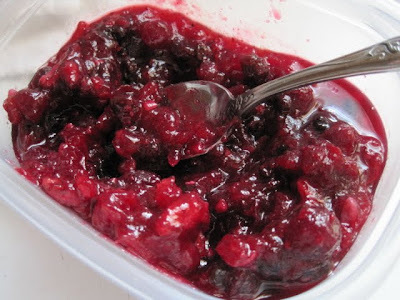 Add cranberries and continue to stir as the cranberries pop and form a thick, jam-like sauce. Add lemon zest, currants and pecans and mix well. Cool completely before serving. 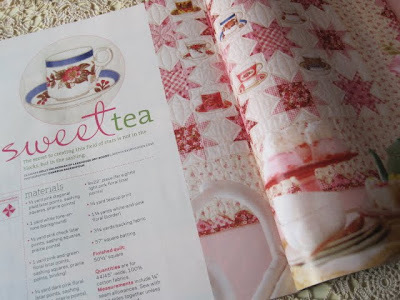 If I didn't already have another 52-week tea project in mind, I would probably be a bit sad about writing today's post! I simply cannot believe it has been a year since I began this tea-tasting project inspired by the 58 teas in "The Harney & Sons Guide to Tea" by Michael Harney. It was more enjoyable and enlightening than I had imagined, and I was pleasantly surprised I was able to find every tea or a reasonable substitute. What have I learned? That I really love tea! 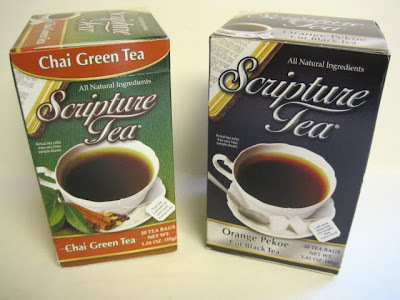 That I am more fond of "pure teas," especially greens, than I knew! That tea is a fascinating subject as well as a delicious, healthful and calming beverage! And I learned that the tea vendors I've purchased from (in the U.S. and one from China) have all given exceptional customer service. I can think of no other category of shopping in which I have experienced absolutely flawless service, but the tea companies all treated me well. (Their shipping rates remain one of the best bargains around.) Finally, I've learned that "The Harney & Sons Guide to Tea" is simply a phenomenal guidebook which no tea lover should be without. After this year of tea tasting, I don't by any means feel like a tea connoisseur (I don't think my palate will ever be that finely-tuned) but rather like someone who has dipped her little toe about six inches into the ocean and realizes there's quite a bit more to be explored. So without further ado, it's time to wind this up and claim my Tea 101 Certificate of Completion! 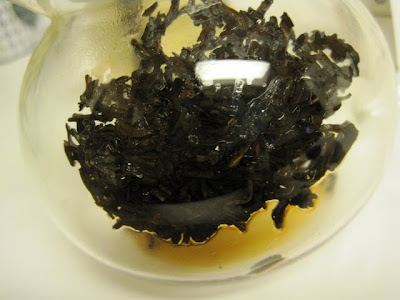 Dry leaf appearance: The Ban-Zhang was thin and wispy; the black puerh had shorter, much more uniform leaves; and the Tuo Cha (slightly bigger in diameter than a quarter) looked like a miniature bird's nest! Wet leaf appearance: How about I let the pictures do the talking? 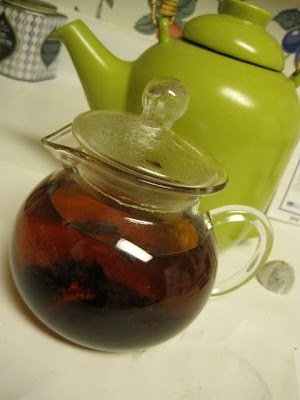 Steeping temperature and time: 1 teaspoon of tea, 212 degrees, 2 minutes. 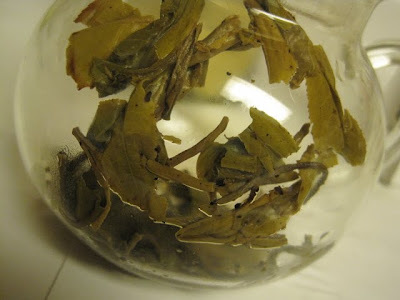 Scent: For the most part, the three teas' dry scents were very similar to the steeped scents. The Ban-Zhang smelled a little like that Creomulsion cough syrup scent I associate with Lapsang Souchong, which had me worried. The black puerh suddenly took me back to an oyster bar on Pensacola Beach because of its fishy scent! (Steeped, this one's scent developed into a "fish in dirt" scent.) The Tuo-Cha smelled very much like the potting soil I used to repot my Christmas cactus a few days ago. 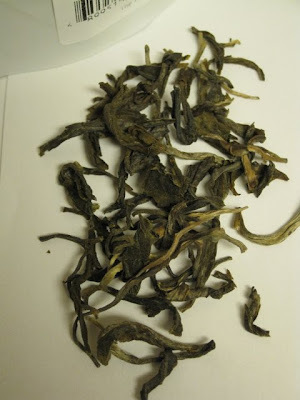 Color: The Ban-Zhang was light golden yellow, the black puerh and the Tuo Cha a deep coppery brown. Flavor: Despite some questionable scents on the front end, all three of these teas produced perfectly drinkable brews! The Ban-Zhang was the lightest and had a lovely buttery quality. The black puerh was definitely stronger and had a little of an earthy taste, but I liked it and wasn't even thinking about fish or dirt! 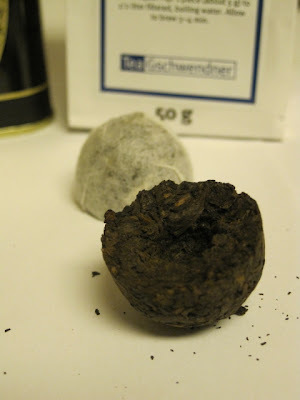 The Tuo Cha was also earthy tasting but quite enjoyable. Additional notes: "Puerhs are prized throughout China as slimming teas," Harney says, and some claim they reduce cholesterol and blood pressure. So ... slimming teas? Well that's enough for me, how 'bout you? (Just kidding. Sort of.) 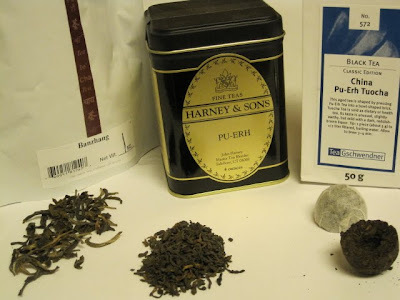 Puerhs are teas that are aged anywhere from 2-50 years and are, as Harney puts it, "an acquired taste." He notes the teas "get their unusual qualities from fermentation, a process no other tea endures." I have tried puerhs before and knew I liked the earthy taste of them. 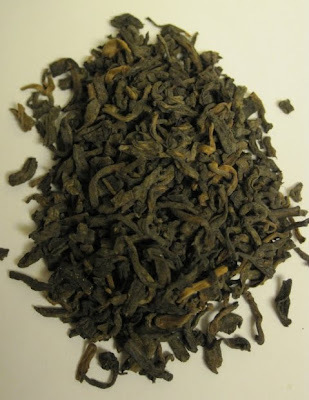 Harney notes the teas have become so popular in Asia that investors now speculate in them, which could be one reason I found an online vendor selling a particular aged cake of Tuo Cha for $138! The book also gives advice for aging your own puerhs. A special thank you to those of you who have been kind enough to encourage me along the way and therefore insure that I would complete these tea tastings this year! Even as a little girl I couldn't wait to open my presents at Christmas, and often I didn't. If there was a way to untape that little flap on the end of the gift where my mom couldn't tell, I would be all in it. Later on, I got skilled at shaking and detecting. One year, I shook a large shirt box and heard a rattling sound inside. I guessed, correctly, that mom had stuck a jewelry box inside a large towel and wrapped the whole thing in a shirt box. But today I have a different kind of question regarding whether or not to open a gift! My friend Liz (the shop owner and decorator) e-mailed a few weeks back to say she'd just come from the flea market where she'd found my Christmas present. I told her I was delighted and knew I would love it, and indeed I do! As we headed out to see "The Young Victoria" the other night, she handed me a beautifully wrapped gift box. It was wrapped in burlap fabric, tied with raffia, embellished with berries, eucalyptus leaves and Christmas greenery, and featured a vintage bird design tag. I *really* should have taken a photo. 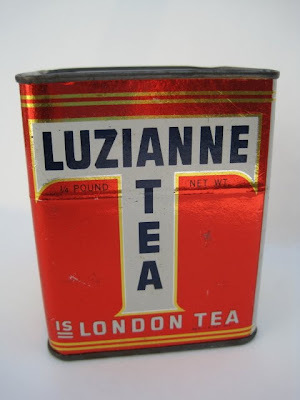 At any rate, this vintage tin of Luzianne tea is what was inside! I wanted you to see all four sides of the tin, so here's the fourth side. But here's my dilemma. 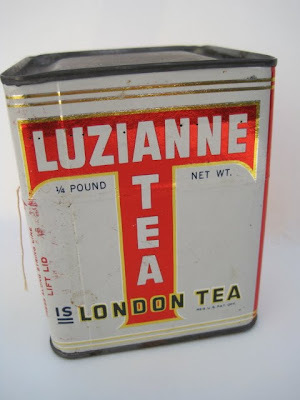 I was riding along and pondering how to get the top off the tea tin when I suddenly heard a familiar rattling sound and realized that, of all things, there is still tea inside and this tin has never been opened! 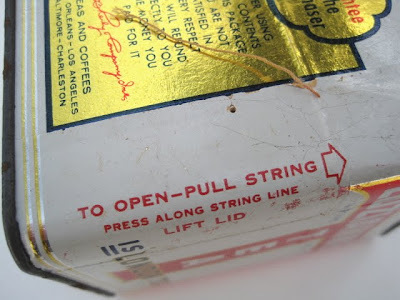 Turns out, this string can be pulled to open the (ancient) tin of tea. But should I? My friend Judy piped in from the back seat to say that yes, of course I should open it and drink it! (I don't think Judy is trying to polish me off, by the way, just curious about the tea!) Liz seemed to maybe be siding with me that no, I should keep it in the original condition. 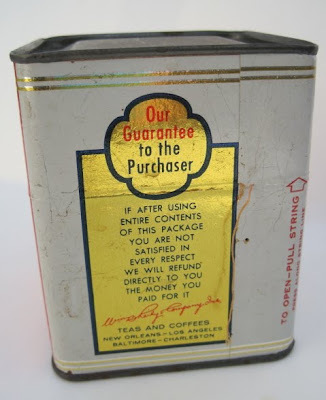 Now I'm certain I won't drink the tea (decades in a metal tin would probably not be a good or safe thing), but I would indeed like to know what it looks like and even if it would brew up properly after all this time. So I need your help here. 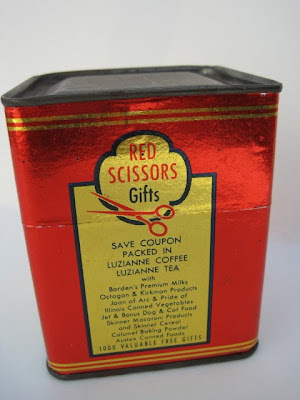 Would you open the tin? 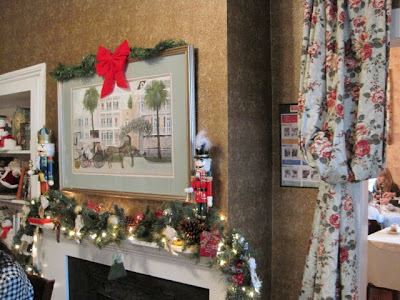 On Saturday, my longtime tea friend Beth and I celebrated Christmas together by enjoying the "Holly Cottage High Tea," a three-course event at our beloved Holly Cottage Tearoom in Newnan. 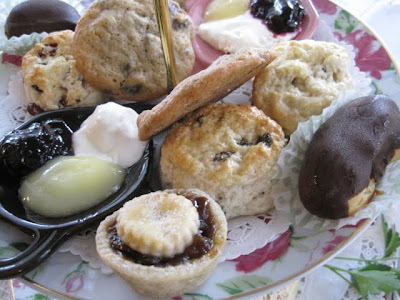 Both of us have been to tea there quite a few times since it opened in September, but neither of us had ever taken time for the High Tea, or as my husband calls such occasions, "the Full Meal Deal." 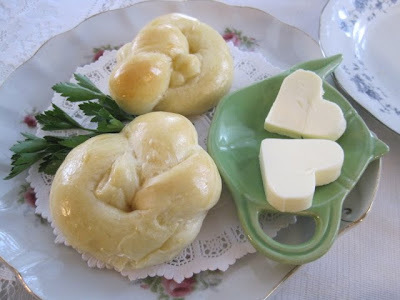 I thought I'd share a few photos of foods we enjoyed along the way, including the famous knot rolls (served with sweet heart-shaped butter pats) made by Chef Linda Rivers. Beth loves their Monk's Blend, and I am currently on a peppermint kick and ordered the peppermint herbal tea. 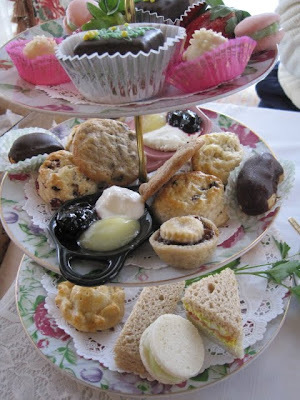 The highlight of the tea, and our second course, was our three-tiered tray of goodies! The savories included a pasty (meat-filled pie, and it was divine! 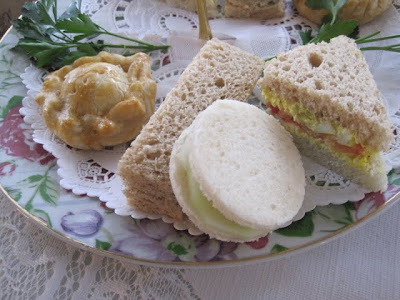 ), tarragon chicken salad, cucumber sandwich and an egg salad sandwich with tomato. Everything was as tasty as it was pretty! 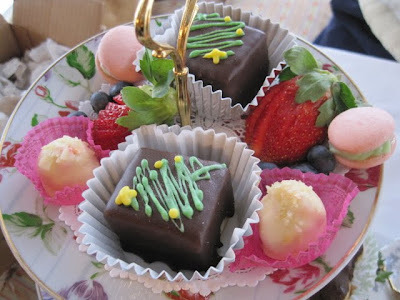 ... trying the petits fours, macarons, hand-rolled truffles and fresh fruit? Well, I knew there was another course to go, so I decided to save most of my sweets for later. I really should have asked for a photo of Chef Linda Rivers, her sweet daughter Michelle and her fellow servers Rachel and Beth, and Linda's delightfully British mom, "Miss Elizabeth," who have brought happiness to so many of us tea lovers in the brief few months they've been in business. Another time! 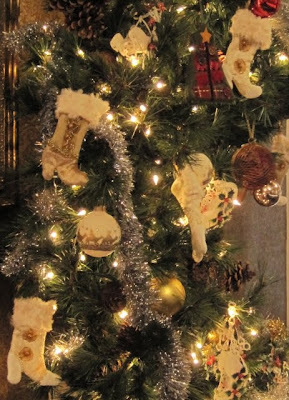 So I'll just leave you with a couple of photos of the festive Christmas decor there. It was just a lovely way to end the year with my favorite tearoom! Last night, several girlfriends and I went to Atlanta to see an advance screening of "The Young Victoria," which I highly, highly recommend! Emily Blunt was great as the young queen who gave her name to an era, and those of us who love the royals anyway will be absolutely smitten with the lush cinematography, beautiful costumes, lovely sets (but hey, they were castles! ), fine acting jobs ... it was just a great film! So although I was perfectly happy to be getting home late for such a very good and fun reason, I needed to warm up with a nice cup of you-know-what. And I simply had to try one of the great new teas that was part of my Christmas gift from my friend Susan! 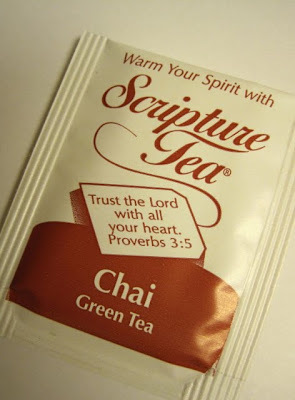 Have you ever heard of Scripture Tea? 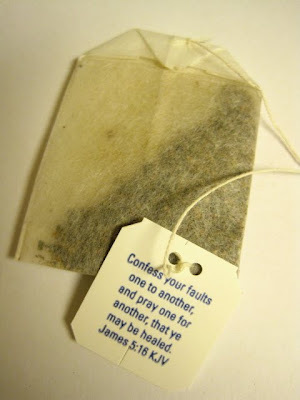 I hadn't, and I definitely love the idea of having scripture right on the teabags (and packets, even). Proverbs 3:5 is one of my all-time favorite Bible verses, so I loved that this is the design on the packets. Over the weekend I baked several batches of cookies to add to some already in the freezer, and today I plan to deliver baked goodies to a few friends. 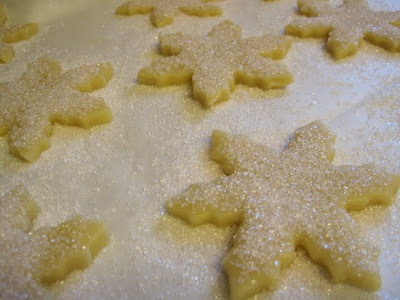 My new favorite Christmas cookies, above, are these White Chocolate Candy Cane Drops (recipe from the truly wonderful BH&G magazine "100 Best Cookies.") 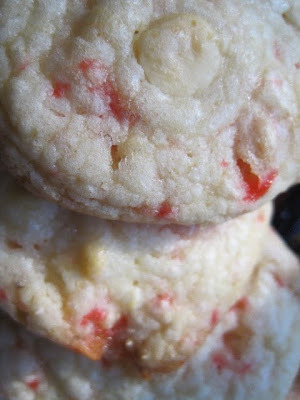 These have chopped pieces of peppermint candy mixed right in the batter, along with both melted white chocolate and chunks of white chocolate. And boy, are they good! 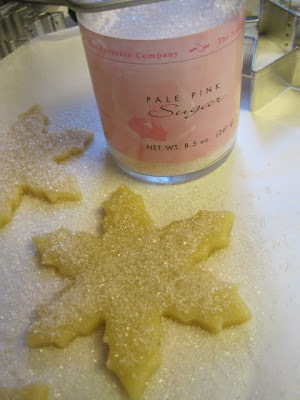 I also made Snowflake Sugar Cookies using some pink sugar crystals my sister gave me. I *love* colored sugars because they're so easy to use! 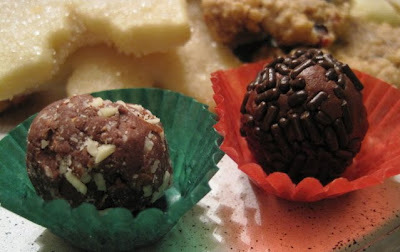 And when I realized I had somehow failed to include any milk chocolate, I made some easy almond flavored chocolate truffles (adapted from a recipe in the Nov/Dec issue of Taste of Home's "Simple and Delicious" magazine). Finally, I made these jam-filled cookies with leftover sugar cookie dough and using a design idea I got from cookies on the cover of the December issue of "Everyday Food." 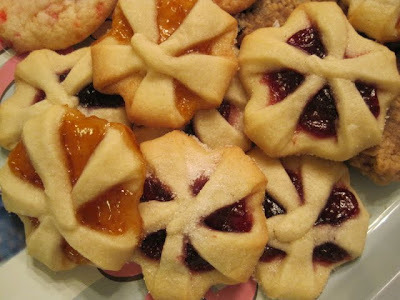 I thought these cookies looked quite impressive, almost like little Christmas package bows. I was so pleased to read inside and learn it's just star shaped cookie dough with the "points" all tucked toward the center of the cookie. 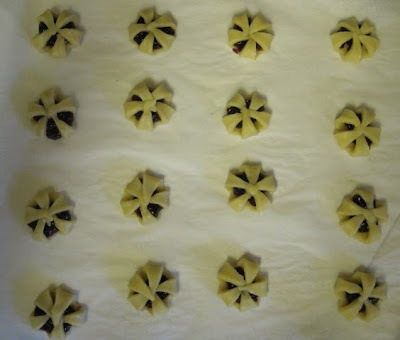 Below is a picture of the technique in case you've got some cookie baking ahead and want to try this. Happy baking! 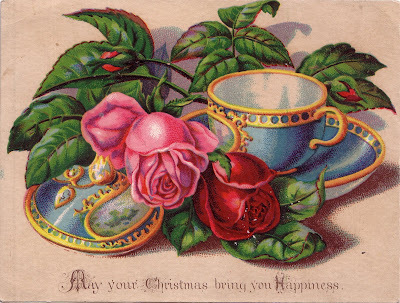 Tiny Tea Series: "A Christmas Wish"